The go-to streaming media box has finally embraced Microsoft's ecosystem. 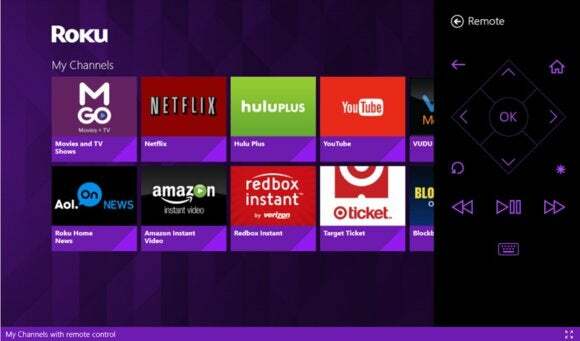 Roku recently released its free remote control app for Windows 8.1 and Windows Phone 8, which allows you to control your Roku player over your home network. The app automatically detects all Roku devices and lets you launch installed channels such as Amazon, Hulu Plus, and Netflix with one tap. Roku's presence in the Windows Store—first noticed by WinBeta—adds another official app from a top-tier video service to Microsoft's catalog. Other big names in the video streaming world are also there, including Crackle, Epix, Hulu Plus, Plex, SlingPlayer, and Netflix. Notable no-shows still include Amazon Instant Video and Google's YouTube (but don't hold your breath on that last one). Before Roku joined Microsoft's apps stores, Windows users were left with third-party Roku solutions, such as Remote for Roku Player and Rokumote. But the presence of an official Roku app in the Windows Store doesn't necessarily mean the end for third-party alternatives. Roku's official app doesn't support features such as "Play on Roku," which lets you stream personal video and audio in select formats to your media player. Presumably, those features will be added over time to the official app. But you can never be sure when it comes to the Windows platform, since many app makers take a more tentative approach and wait to see the level of user adoption before beefing up a Windows app's capabilities. Nevertheless, it's a great day for Roku fans longing to launch MLB.TV from their Surface.